Raw energy is key to the appeal of the Civic Type R. Not everyone will like it, but those who do ... will love it. If ever a car signalled its intent from the moment you laid peepers on it, the Honda Civic Type R is that machine. There’s no mistaking this be-winged motor is anything but a hot hatch. However, it’s not just any old fast hatch, this is a 316bhp performance car that dashes off 0-62mph in 5.8 seconds and will head on to 169mph. Yes, it is that quick and it puts most others in this class to shame with those figures. The Type R is knocking on the door of the likes of the Audi RS3 and Mercedes-AMG A45. 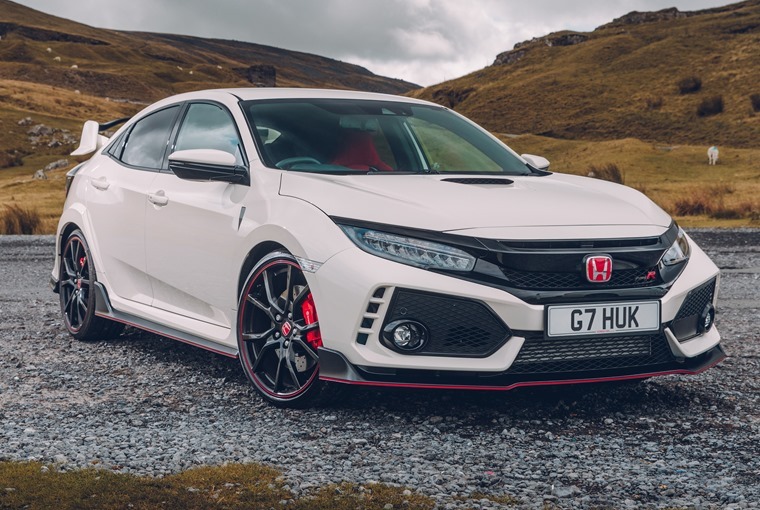 It also means the Honda is knocking on the door of the likes of the Audi RS3 and Mercedes-AMG A45, though the Japanese contender undercuts their list prices by some margin courtesy of its starting bid at £30,995. Go for the GT version and you’ll add a further £2,000 to the list price. So, what do you get for your money other than some very rapid numbers? 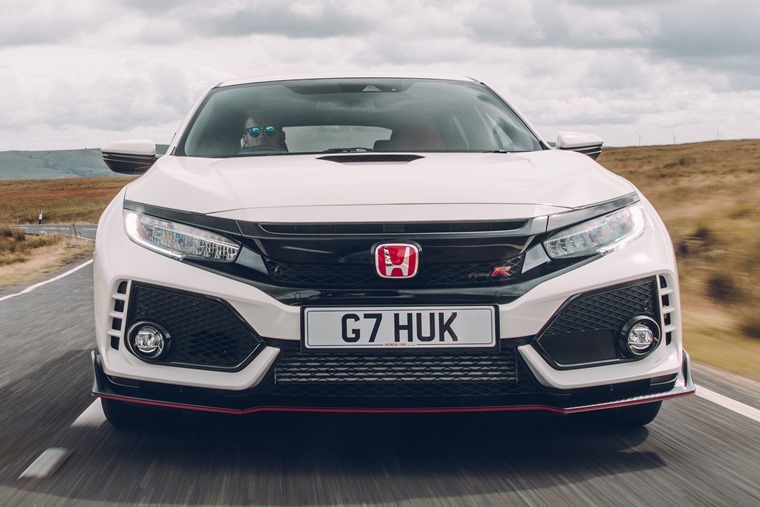 For starters, under the bonnet is a refined version of the turbocharged 2.0-litre petrol engine that made such an impression in the previous Type R.
It delivers its maximum power at 6500rpm, so it’s not as stroppy as some others to have borne this famous badge. Also, there’s a healthy dollop of torque, with 400 Newton metres of the stuff ready to go at 2,500rpm and it stays put till 4,500rpm. Honda has managed to engineer in that elusive quality we call ‘character’ to the Civic’s engine. One things for sure, this is not a hot hatch you need to worry about keeping in a narrow power band or having to drop several gears to lift the pace. There is a faint whiff of turbo lag, but it’s never going to hold you back from having fun. This means the Type R may not appeal to some of the diehard Honda faithful. You know what? That’s their loss as this Civic Type R is a blast to drive. Honda has managed to engineer in that elusive quality we call ‘character’ to the Civic’s engine. It makes you want to use this car’s potential at every opportunity and it will rev cleanly and quickly to a 7200rpm redline. It may be turbo’d but it still feels like an old-school Honda VTEC in this regard. 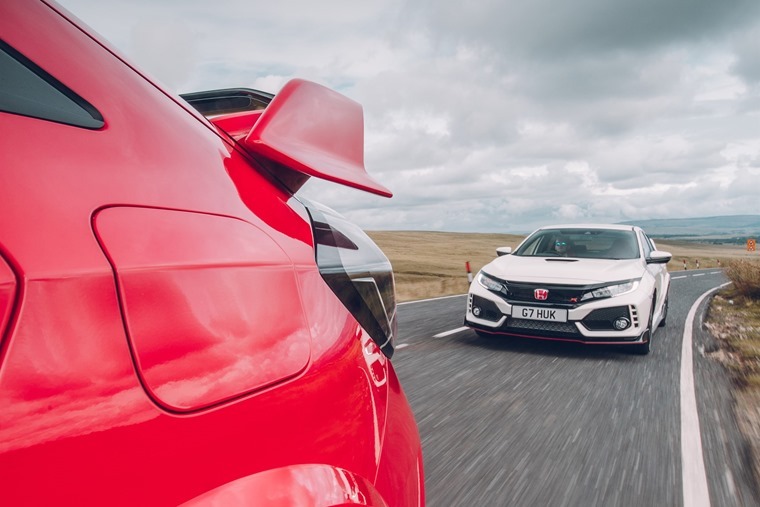 It's an even more engaging driver’s car than the previous Civic Type R.
As for delivering that power to the road, it’s all shuffled through a limited slip differential to the front wheels, so no all-wheel drive assistance or excess weight. You also get a snicky six-speed manual gearbox that has the sort of change you use just for the feel of it. 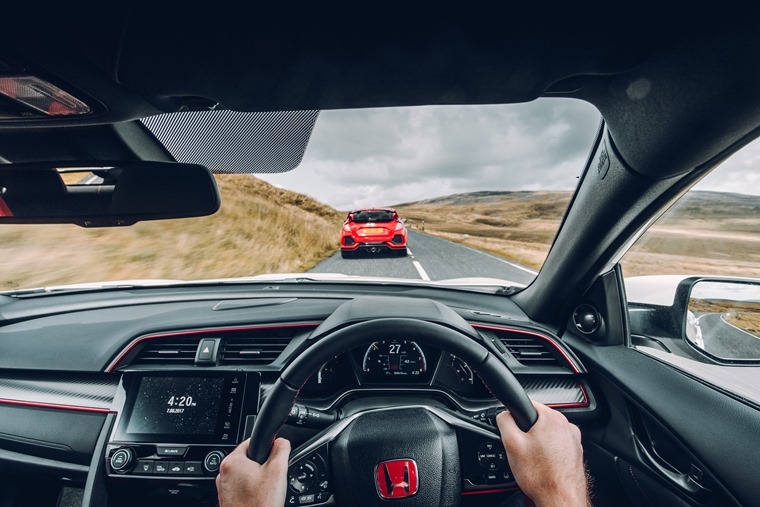 As a result, Honda has come up with an even more engaging driver’s car than the previous Civic Type R. It loves to work hard through the gears and treats you to in-gear acceleration that will keep a Volkswagen Golf R on its toes. Yet this is no mere dragster because the Civic is just adept at dealing with corners. For those who love the compliance of the Golf R or GTI, the Type R is going to be too firmly suspended for them. You feel the bumps, but you’re not battered by them. 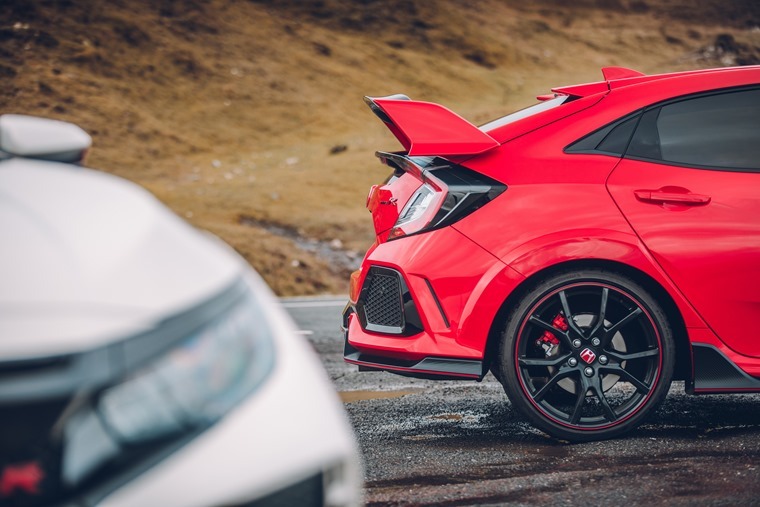 There’s a firmness that underpins every movement, so you can tell Honda had track day use in mind when developing its latest hot hatch. On the average British B-road, that could spell disaster on the handling front, as many have gone down the stiff suspension route only to make the car undriveable. It’s telling the Type R comes from a company with a large base in the UK as it deals with cratered surfaces in a competent manner. You feel the bumps, but you’re not battered by them, though the Honda is harder to get into a flow on these sorts of road than the Volkswagen. You also have a choice of suspension set-ups via the switch on the transmission tunnel. Swap from normal into Sport and the Type R is ideally configured for smile-inducing back road fun. Should you be tempted by the +R mode, don’t bother. This setting is way too brittle for road use and is best reserved for heading to a local race circuit. The steering is track-focused; quick, sharp and precise. 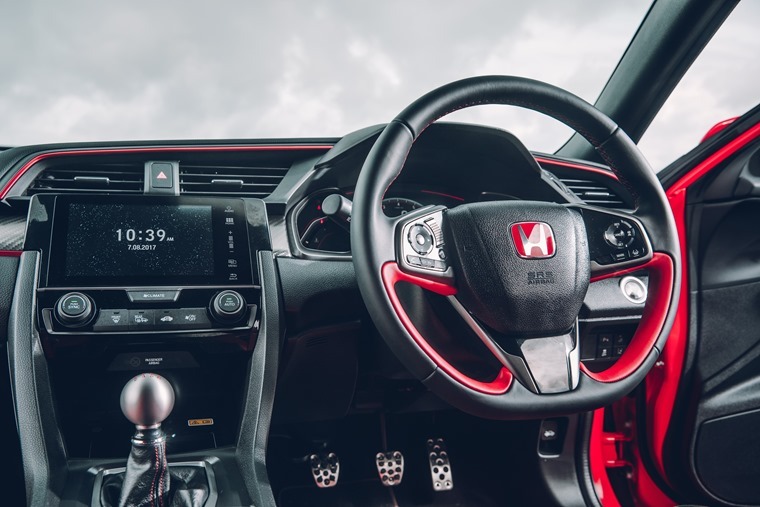 Turning our attention to the steering, it’s another example of the track focus for this Honda. It’s very quick to react, sharp and precise. That makes it easy to point the nose of the Honda into a bend and hold it there. Where you might get frustrated is negotiating a supermarket carpark as the lock is notably worse than most of its rivals. As you’re looking for a parking spot, you’ll have time to appreciate the new, lighter seats in this Type R. They’re trimmed in bright red Alcantara, so this is not a shy or retiring cabin. However, the seats are positioned lower to the floor than the previous Type R’s, so you feel more in than on them. More splashes of red are used on the steering wheel, while ambient lighting in the same hue glows from the doors and dash binnacle. As with all Type Rs, there’s a titanium gear lever ball that feels just right in your hand. It’s just a shame the infotainment screen looks like an afterthought. Choose the GT trim over the standard model and you gain wireless mobile phone charging, dual zone climate control, satnav, Blind Spot and Cross Traffic monitoring, and all-round parking sensors. For the extra bit of money per month, we’d recommend this version. Whichever of the two Type R models on offer, you get 36.7mpg combined economy and 176g/km carbon dioxide emissions. A Golf R manages 37.7mpg and 180g/km, so you can see the Honda is right in the hunt. And that’s where it should be. 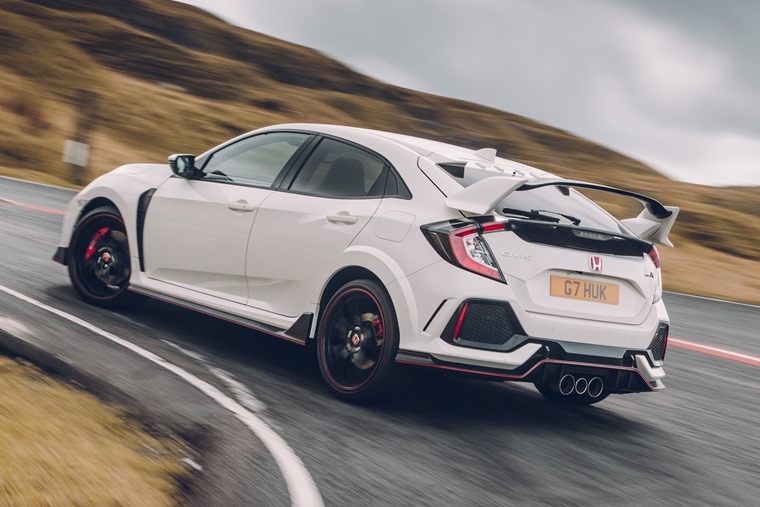 It’s a different take on the hot hatch theme to many in this sector, but its raw energy is key to the appeal of the Civic Type R. Not everyone will get it, but those that do will love it – even the brazen looks. *Average lease prices calculated using ContractHireAndLeasing.com data and correct at time of writing.